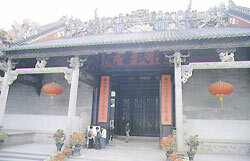 Also known as Chens' Academy, this ancestral temple is situated at 8 Sun Yat-sen Road, Guangzhou. Construction of it began in 1890, or the 16th year of the Guangxu Reign, and came to completion four years later. A well-known ancestral building in Guangdong, it is composed of nine halls and six courtyards, covering a total space of more than 10,000 square meters. The layout is well conceived, the buildings look imposing, the ornamentation is intricate, and the entire place is a splendid piece of architecture. While traditional architecture is well preserved in this family temple, a local decorative style is palpable in every minute detail. 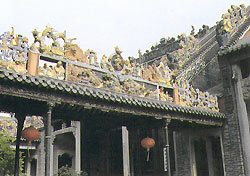 Among all the family temples, the Chens' Ancestral Temple is the best preserved and most imposing-looking. Today it has been converted into the Guangdong Folk Art Museum. The government has put it under due protection as a national cultural legacy.